If you would have told me a year ago that I’d ever think of making a garlic free pesto I would have declared blasphemy and told you that you’re out of your mind. I looove garlic. I come from a garlic loving family. Pesto and garlic go hand in hand – you can’t have one without the other. It’s like taking the tomatoes out of a marinara sauce – oh wait, I did that too! Apparently all bets are off with me and my food preparation. 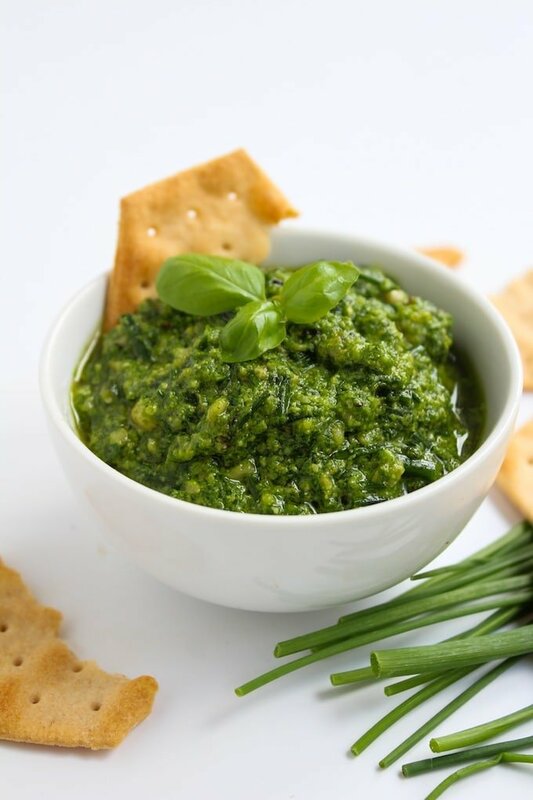 And yet, as is often the case, here I am eating my own words to share with you this garlic free, low FODMAP pesto. As much as I love my garlic, I can honestly say that I don’t miss a single thing in this sauce. In place of where I would normally use garlic, I swapped it out for chives to get that sharp, onion-y taste. Not only is this garlic free, but I also subbed the traditional parmesan with nutritional yeast to get that cheesy taste. If dairy isn’t an issue for you then feel free to use the real stuff. As much as I love garlic, I’ve grown to view it in a different light this past year. When you’re forced to cook without something that is relied upon so heavily, you find ways to do without. Sometimes experimentation works, and sometimes it doesn’t. As frustrating as I found it to cook without it, I know cooking this way has made me a better cook in the long run. There’s actually a really interesting article about an Italian born chef who moved to Toronto to start his own restaurant. During the first 12 months of his restaurant, his staff were forbidden to use any garlic of any kind. The second year, they were allowed to use garlic infused oil. Finally after 2 years, his chef’s were allowed to cook with garlic after they had “learned how to use garlic in the right way”. Full disclosure, we’ve actually started introducing garlic and a few other high FODMAP foods back into Mike’s diet these past couple of weeks. Since he started following the Specific Carbohydrate Diet (basically no starches and grains) he’s been tolerating foods that were previously off limits sooo much better. Avocados, full fat coconut milk, dates and blackberries are back on the table. Even eggs were an issue for a while, but he’s having those again now much to my excitement. However, we don’t want to push the boat too far out from shore so we’re really just dipping our feet in the water at the moment. Even though he has been able to eat small bits of garlic without issue, I’m still preparing him mostly FODMAP free foods. It’s been a lot of trial and error, but I feel like we’re making progress with his diet. You can also easily substitute the extra virgin olive oil in this recipe for a garlic infused olive oil – just make sure that it is one that doesn’t have bits of garlic floating around to keep it low FODMAP. 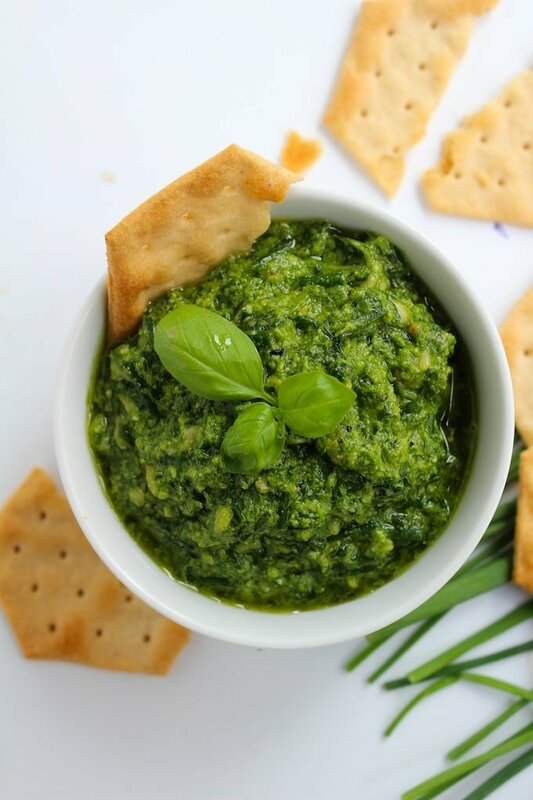 Add all of your ingredients to a blender or food processor and process until you get your desired, pesto consistency. Season with salt and serve. Not on the FODMAP diet but do have IBS and in particular, “garlic issues”. And I also love pesto and other garlic containing foods, so love when I find alternatives. Looking forward to trying this. I have a ton of basil on my hands and more to harvest. This turned out wonderful, and so happy to have a safe fodmap version. I doubled the whole thing and put 1/4 cup garlic infused oil and 3/4 cup canola oil (that’s what I had). Too bad those pine nuts are so darned expensive, oh well. I’m so glad you liked it! Thanks for coming back to let me know how it went! If there are any low fodmap nuts that you can tolerate you could try using those in place of pine nuts or at least half the amount of pine nuts so it goes farther. I’ve been playing around more with using different nuts in pesto and it does the trick for me! 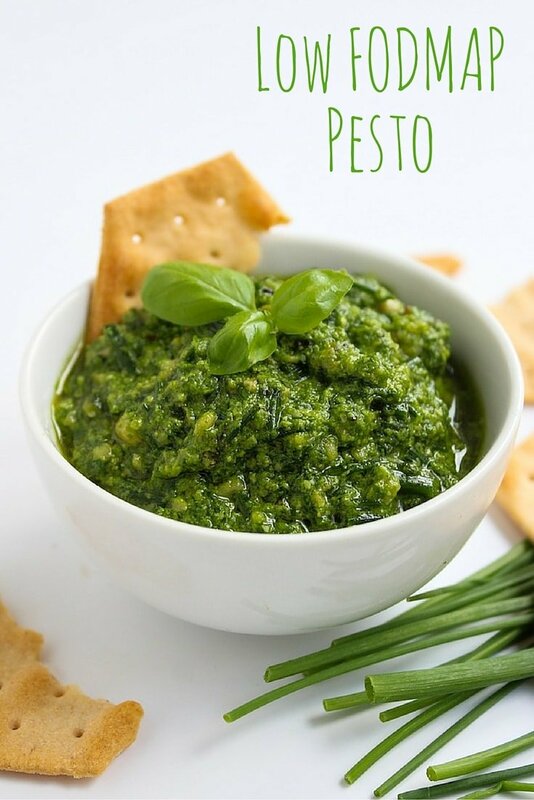 Finally, a low FODMAP pesto recipe that is actually low FODMAP! I can’t wait to try this out! I just tried this recipe, and I honestly can’t believe how garlic-y it tastes! Thanks for sharing this! I’m definitely adding this recipe to my favourites. Thank you so much for all of the wonderful low fodmap recipes! My daughter has been missing pesto…Looking forward to making it tonight! This recipe inspired me to make pesto for the 1st time, yay! My daughter has just been put on the Fodmap diet so I was thrilled to find your recipe. I substituted a few things for ingredients I didn’t have (chopped pecans for pine nuts, balsamic vinegar instead of lemon juice, and added a handful of fresh spinach). It turned out GREAT and my daughter loved it. Thanks so much!! Yay! That makes me so happy to hear! Your substitutions sound delicious – you’ve got me dying to use balsamic vinegar the next time I make pesto. Thanks for coming back to leave a comment! I am now on the FODMAP diet and have really been missing pesto. I found your recipe was excited about making it. I put cooked boneless skinless chicken breast in the sause, heated it and served over pasta. I used the broth from the steamed chicken to thin out the sause a little. I mixed a little garlic infused oil in with the olive oil. A little of that goes a long way. DELICIOUS!!! My husband and I thought it was better that the pesto sause I always bought before the garlic free diet. 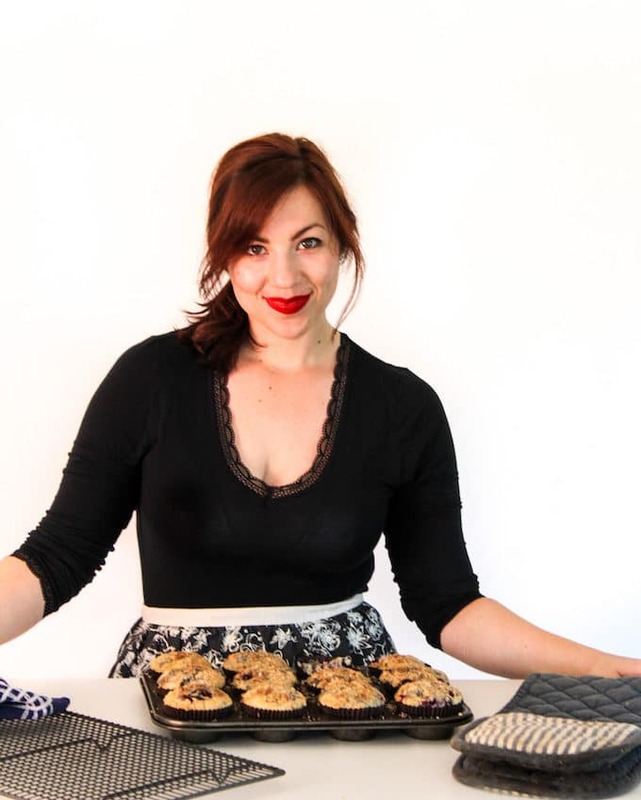 Thank you for your creative FODMAP recipes. Hi! Quick question, does this amount of pesto do well with 1 lb of pasta? More/less? Thanks! This was so wonderful! Thank you! I made it and used it for a salmon dish, which was amazing. This is great! How long can I leave it in an airtight container in the fridge for? This looks so good Sarah! I love the addition of the chives in there! I bet it gives it a ton of flavor! I love to experiment with different pestos, but I have not tried chives yet. It sounds like a great addition to a pesto. 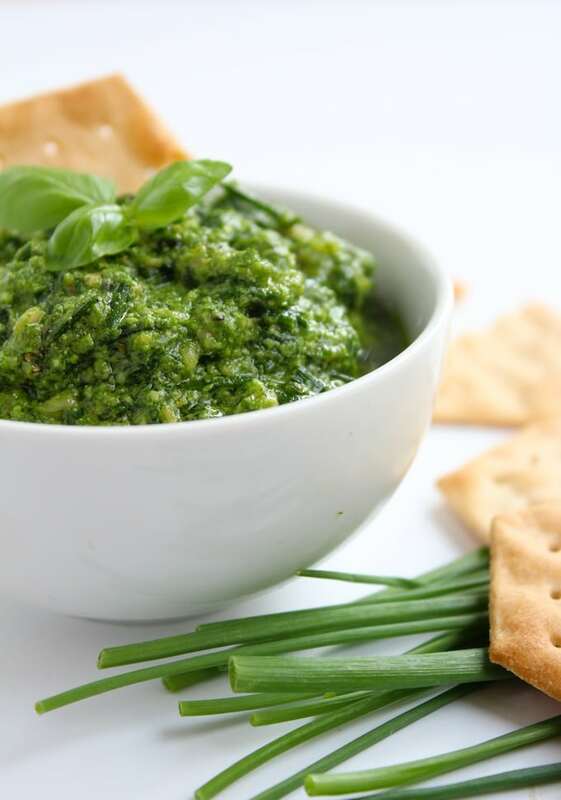 Chives in pesto are amazing! I’m also liking to try different pestos as well – so many amazing flavors! I think it’s so awesome that you’re figuring a way to get similar flavours without using ingredients that you’re familiar with. I am a HUGE garlic lover but since reading this, I will definitely try chives to switch things up a bit (and keep things fun and interesting)! It’s been interesting trying to work without, but I think I’m a better cook for having to do without….still love garlic though! Too add the garlic flavor, try using garlic infused olive oil. That looks really wonderful! Gonna have to try this one! Thanks, Chris – hope you love it as much as we did! I love pesto, but for some reason I never think to make it! This looks so bright and refreshing and I’m sure you don’t even miss the garlic. Yum!! You should definitely try making your own – once you do you’ll never go back. Thanks, Jessica! love the Low FODMAP version.we are always looking for more FODMAP diet recipes! YUM! Thanks, Lindsay! Hope you like it! I was on the Low-Fodmap diet for about a year. It was difficult, but I got better, and have since become more mindful of what I eat. I love nutritional yeast. Don’t miss cheese at all. You have me so intrigued…no garlic. I definitely will need to try this. Haha, I know how you feel – garlic without pesto still sounds strange to me. I was pleasantly surprised when I realized that this still worked as a less garlicky pesto. Hope you like it as much as we did! Pesto is one of my favorite things. I have a weird reaction to pine nuts, unfortunately, so I always sub for pumpkin seeds. But I love that you added chives…I’ve never thought of that and I love them! Ooh, I like your idea to add pumpkin seeds! I’m going to try that out – thank you!